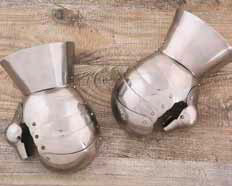 Medium-Large pair of stainless steel gauntlets designed for sport combat such as SCA Combat and similar combat sports. The very well made articulated thumb is unusual historically but adds increased protection from training swords. Supplied without attachment holes for a glove, the wearer must do some work to adjust and fit the glove/gauntlet for individual use. Note: The thumb position is frequently changed by means of removing and repositioning the existing rivet, allowing a better fit for different hand sizes. This is not a replica of any particular existent gauntlet, but is typical of tournament gauntlets of the last 15th and 16th Century. This page was last modified on 17 June 2013, at 21:29.